Taurus' new .45 ACP load is the result of teamwork. The bullet is a Barnes XPB 185-grain JHP. The powder is from Hodgdon, and the ammunition is loaded by PMC. The bullet is 99.95 percent pure copper. Despite its Brazilian roots, the load is 100 percent made in the USA. Anyone remotely familiar with the world of firearms has probably been involved with a Taurus firearm in some way. Getting off the ground just more than 60 years ago in Porto Alegre, Brazil, Taurus is quickly becoming a household name, it seems. It looks to me like the company is just getting started, too! 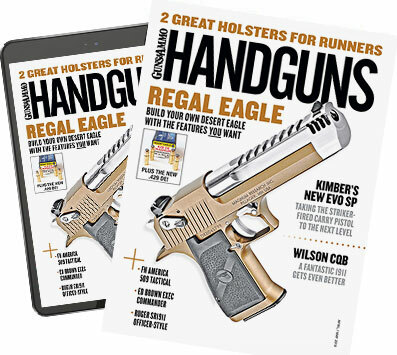 While the Taurus name is most often associated with handguns that include the big double-action .454 Casull Raging Bull, it appears that it's going after a big name in the ammunition arena, as well. The first of the new Taurus loads I've acquired is the TCB45ACP, 185-grain JHP load. If this load is indicative of Taurus' future offerings, I'll be impressed. In fact, I'll probably dump a whitetail with this load this deer season. Taurus calls this new line of JHPs simply the Copper Bullets line. The copper bullet technology is straight from Barnes Bullets, long associated with quality bullets. The Barnes XPB bullet is constructed entirely (99.95 percent) from copper, and it's quickly gaining a great reputation in the field. Barnes says that the XPB bullet may penetrate more than 25 percent deeper than lead-core bullets of similar weight while exhibiting classic, uniform expansion with enviable weight retention. This solid-copper bullet technology is so impressive that Barnes bullets are used by Federal in some of its shotgun slug loads, as well. The same technology is being used by some very knowledgeable muzzleloaders these days. With a Barnes copper JHP on top, it stands to reason that Taurus would select only the best powder. Hodgdon Powder supplies the powder for this load, although it's not a canister-type powder that is available to the general public, according to the third member of the team--PMC Ammunition. PMC uses new nickel-plated cases for this standard-pressure load and nonmercuric, noncorrosive primers. The 185-grain JHP penetrated deeply in the ballistic gelatin, ending up 10 7/8 inches from the entrance point. I was only able to get 40 rounds of the new load for this work so I only used one arm--a proven Kimber Custom Target .45 equipped with the standard 5-inch barrel. This rig will usually stay within 2 1/2 inches with the very best target ammo, and it has been my test mule for several years. The standard-length barrel extracts good velocity from most loads, and it serves as a good measuring device where .45 ammunition is concerned. Because the ammunition supply was limited, I decided to eliminate any human error in this work and mounted the Kimber in the trusty Ransom Master machine rest for the entire range session. I'd prefer running a load through a couple of rigs in and out of the machine rest, but by the same token five 5-shot groups do tend to reflect the norm for a round. All shooting was done at 25 yards with the Oehler 35P chronograph catching the velocity about 15 feet from the muzzle. When the dust settled, this new Taurus load proved to be impressive by any measure. The 185-grain copper JHP slipped over the skyscreens at a 956-fps average with an extreme spread of 48 fps and a standard deviation of 13 fps. The load accounts for an instrumental energy of 375.4 ft-lbs, placing it nicely in the hunt to be sure. While it's possible to get 500 ft-lbs out of a strong .45 with +P ammunition, this load should do the trick most of the time if it's placed right. The first group with the combination went just over an inch and a half, but things opened up a bit thereafter. Such is the life of most Browning-style semiautos. In the end, the five groups went 1.57 inches, 4.15 inches, 4.65 inches, 3.65 inches and 2.23 inches. The five groups averaged 3 1/4 inches, and that's excellent accuracy in my opinion. The load is just as impressive in ballistic gelatin. As usual, the gelatin shot took place with the muzzle of the Kimber located 10 feet from the heavy gelatin block. The bullet ended up tipped downward 90 degrees, resting 10 7/8 inches from the entry point. I'd call this penetration very nearly perfect if self-defense is the aim. In addition, the recovered bullet is a work of art. Weighing 185.1 grains, it has 100 percent of its starting weight. The bullet expanded uniformly to very nearly double the starting diameter, measuring .861 inch. The permanent cavity was uniform and quite large, as well. This load and other similar Taurus loads should begin showing up on dealer's shelves soon, if it's not there yet. I think you'll be as impressed with the new ammunition as I was. Not long ago I had the pleasure of working with a new Taurus Stellar Tracker .45 ACP revolver. That little wheelgun is one of the nicest revolvers I've had in my hands. It looks like Taurus' ammunition is just as good. Contact Taurus Int., Dept. HG, 16175 Northwest 49th Avenue, Miami, FL 33014; (305) 624-1115; www.taurususa.com. All test ammunition fired through a 5-inch Kimber Custom Target mounted in a Ransom Master machine rest.